Now we shall address one of the most critical issues of our time: the perfectly crafted martini. First we shall address the issue of gin vs. vodka. If you want to throw vodka and dry vermouth into a martini glass and call it a martini, go right ahead. I’ll keep my snarky comments to myself and let you enjoy your drink. But that’s like throwing scotch, lime juice, and triple sec in a margarita glass and calling it a margarita. It just throws the whole universe out of whack. I have encountered many people who will not try any drink made with gin. Invariably, I have found that the reason is because as part of their wayward youth they drank cheap gin, wound up hugging porcelain in somebody’s bathroom, and swore never to touch the stuff again. This is a sad and tragic, not to mention illogical, mistake. Unlike most liquors, gin is a recipe. Each brand of gin is quite different. The alcohol is flavored with natural botanicals, such as juniper, coriander, citrus peel, cinnamon, almond, or licorice. My personal favorite is Hendrick’s gin, which has a hint of cool cucumber flavor in the recipe. Next we shall address the issue of vermouth. There are lots of Italian vermouths out there. Come on, people. Vermouth is a fortified wine, also flavored with natural botanicals. If it starts out as wine, go with the French. My personal favorite is Noilly Prat. How much vermouth to put in your martini is a matter of personal taste, but if you have any taste at all the amount is not much. I like just a few drops. Seven drops is about right. It is perfectly fine if you skip the vermouth altogether. There are many anecdotes about how to make a very dry martini. The best method I have heard is to set the vermouth bottle on the bar and make the martini in its shadow. The gin and the vermouth are poured into a shaker filled with ice, but James Bond be damned, don’t shake the thing. 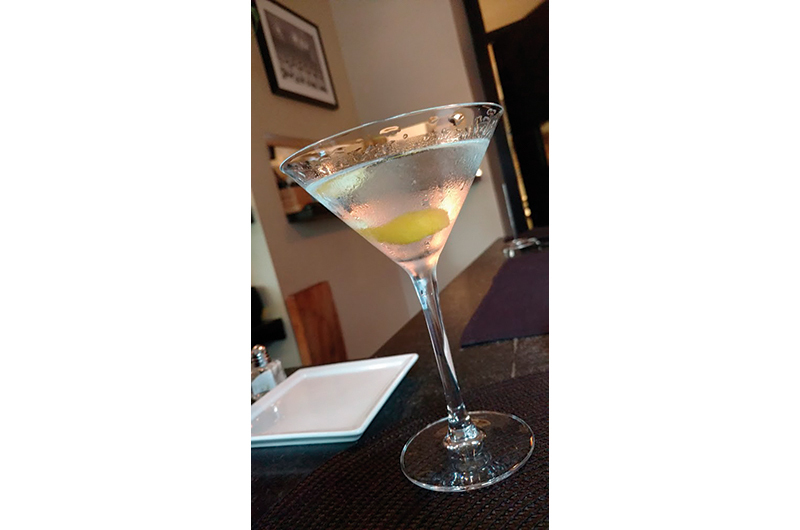 A well-made martini must be stirred, and stirred vigorously, then strained into a glass. To shake gin is to bruise it. Probably hurts its feelings, too. Bruised gin comes out of the shaker with a gajillion tiny white air bubbles. Bruised gin deprives the martini drinker of that divine, crystal-clear visual appeal. Many people, including professional bartenders, go wrong on this part. Next we shall address the issue of garnish. A green olive or two or three is perfectly correct and acceptable, but I can’t think of a better way to ruin good gin than to throw salty olives in it. I much prefer a twist of lemon. The twist releases the oils from the lemon rind, which gives the drink a glorious flavor. I have tried martinis at most of the finer establishments here on Martha’s Vineyard, and found most acceptable if not exceptional. The long (sadly) departed Sidecar Cafe in Oak Bluffs was my favorite. But I have never been the slightest bit disappointed when I ask for a martini at Détente in Edgartown. I stopped there the other day for a peach salad and a cold martini. Heavenly. Finally, a disclaimer. All of the preceding opinions on how to make a martini are my own, and not the opinion of the many, many people who are dead wrong about this stuff.